First, his spaceship gets thrown into a distant galaxy. 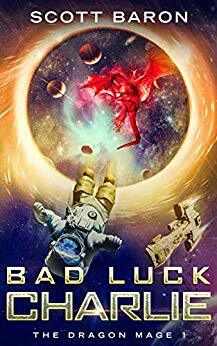 But to make things worse, Charlie finds himself faced with alien space pirates, talking dragons, and something that seems a whole lot like magic. Far from home, lost in a strange world, he’s a space-age Robinson Crusoe––only his man Friday is a blue-skinned alien, and this isn’t just a desert island. It’s a whole new galaxy. $0.99 on Kindle. Visit gagaoverbooks.com daily and download more books like "Bad Luck Charlie: The Dragon Mage (Book 1)" . We're dedicated to bookaholics, and each day we feature new free and discounted Kindle ebooks in the Science Fiction & Fantasy genre as well as other categories of fiction and non-fiction. Disclaimer: The price of Bad Luck Charlie: The Dragon Mage (Book 1) was accurate when this post was published on March 20th, 2019. However, Amazon can and does change Kindle book prices frequently and without notice. Always look closely at the price of an ebook on Amazon before clicking that yellow button. If you purchased a Kindle book by accident, it's simple to return, just follow the return instructions here.